INTELLIGENT OPERATION PANEL: LCD blue display with Manual & Auto 2 models 10 electronic speeds provide extra mixing power to work and ensure even mixing at any speed, save time and energy while providing outstanding results. 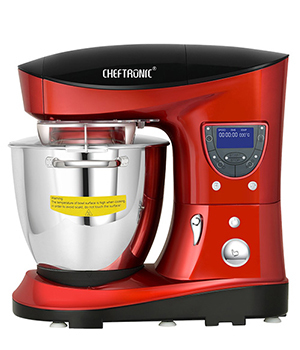 CHEFTRONIC electric stand mixer with blender and mincer makes short work of your food preparation needs. 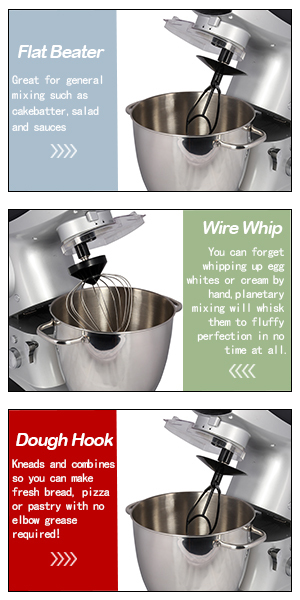 With three attachments that act as a dough hook, beater and whisk, each connected to the variable speed control on the arm, allowing you to customize your machine, baking and mixing is fast and easy. 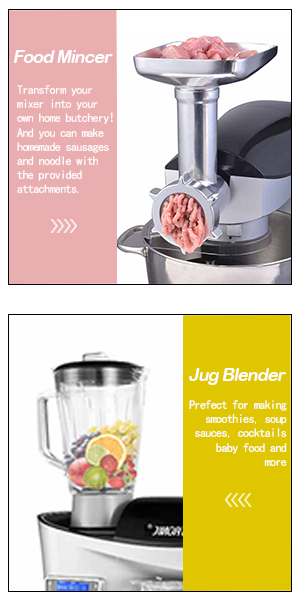 The blender jug makes smoothies and soups in minutes, while the mincer enables you to not only mince the meat, but also turn it into homemade sausages and kibbeh anytime. The attachments are very easy to change, with a simple pushing and turning motion to lock or unlock them for swapping over. 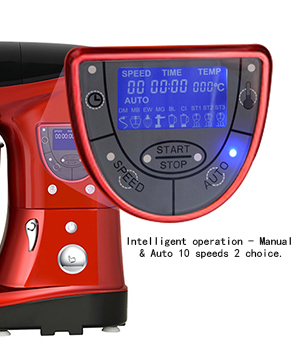 The variable speed dial controls how fast the attachments rotate, so you have the best control over the mixing process. To ensure the mixer is safe and stable during use, there are sucker feet to the bottom to hold it in place. The arm also features a safety lock to prevent any movement during use - simply use the switch to raise or lower the arm, then release to lock in place. 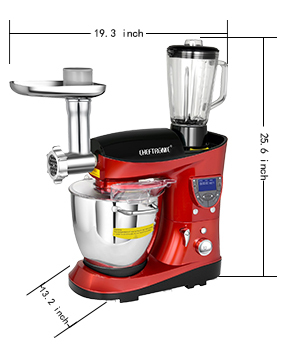 --- All in one and quality with glass blender, stainless steel bowl and metal grinder son the mincer. 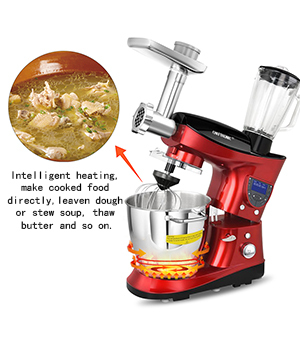 Heavy duty motor, 1000w is capable of mixing large quantity without a struggle and this machine has the added bonus of a heat element to help with raising dough, making soup, choux pastry etc. --- Imagine all your food preparation needs in one machine, everything from mixing, stirring, blending, food processing and cooking. With the combined planetary mixing and precise temperature control, it is easy to cook fresh, healthy meals for you and your family in this culinary center. The two extra attachments (food mincer and jug blender) are detachable, when they aren’t in use you can take off and put away and your mixer can store and looks like a regular mixer. 1. No soaking to the bottom of a bowl as heating when clean. The bowl can't cook without little liquid or boil away all the liquid, otherwise the bottom of the bowl will burn easy. 2. Wipe metal parts with a little vegetable oil before storing to keep your meat grinder attachment in the best possible condition. 3. Please turn around the bottom foam packaging and check it carefully, the dough hook, food pusher, cone, sausage fittings are here. Sorry, it can't. 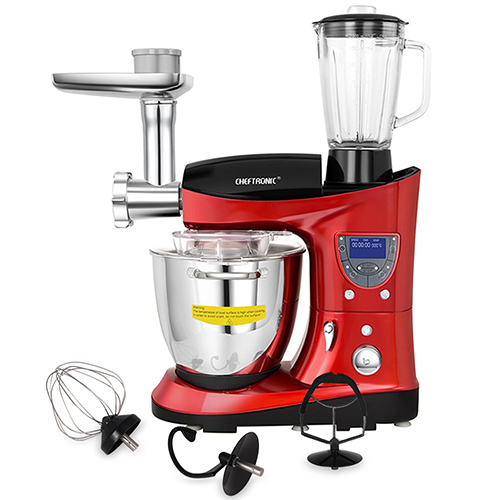 The Cheftronic stand mixer SM1088 power supply is 120V/1000W, 50/60Hz, the Adapter of this machine is US standard. Those all can't fit the Japan standard. Does it have an automatic shutoff (for over heat, etc)? The stand mixer will stop working after continuous working for 15 minutes, due to set the program safely. I cannot find the warranty registration. It was upgrading until 10-15, but does not seem available. Any one have better luck? Very disappointed in heated bowl function. Burns very quickly everything I've tried. Can't fond any instructions for proving dough, making custard etc. that other reviewers say is so wonderful! Have had no reply from Cheftronic except to say look at the online recipe book in which I can't find any help. Have asked for specific help but no reply to several emails, even to the ones they have sent to me asking how I'm getting on! Rest of it's OK, except the jug is very hard to clean, but no different to many other mixers. This mixer is absolutely amazing. I didn’t think they could be so stylish but I actually don’t mind leaving this machine on my counter! The red color is beautiful, looks great in the kitchen. It’s very sturdy (and heavy), it has suction cups on the bottom that have a nice grip and keep the machine in place. 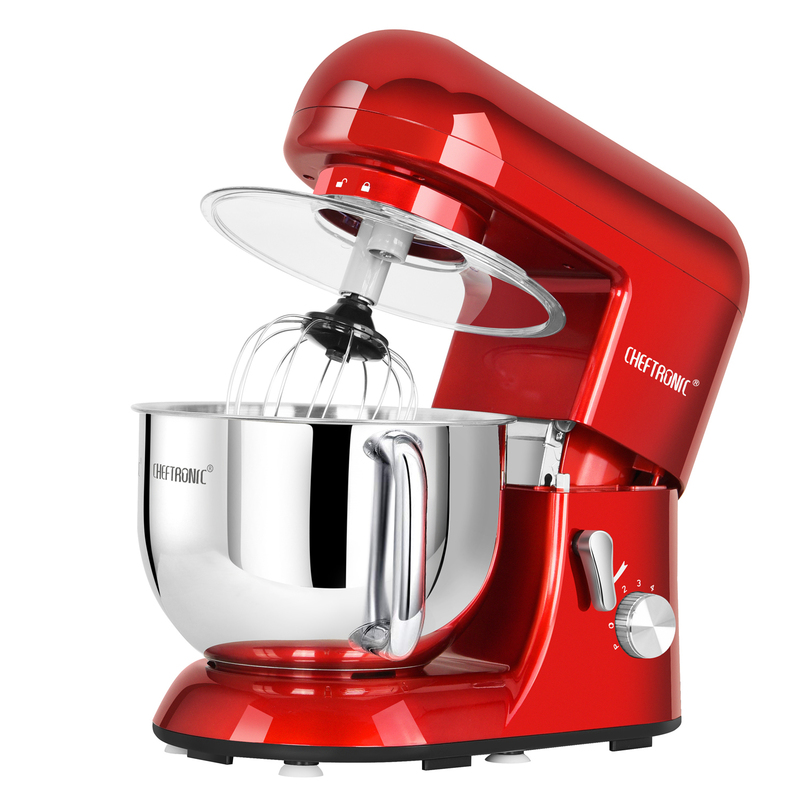 I have to admit, I was a little intimidated when I first saw this mixer in person, but the instructions were easy to follow and in no time I was successfully mixing my cake. The LCD screen is bright and easy to follow. It comes with a ton of attachments and accessories; mincer, beater, whip, dough hook, blender and pouring shield. I love the heating element on this mixer. I can brown meat, make stews, custards, just about anything. Do not let the price scare you. It is worth every penny. 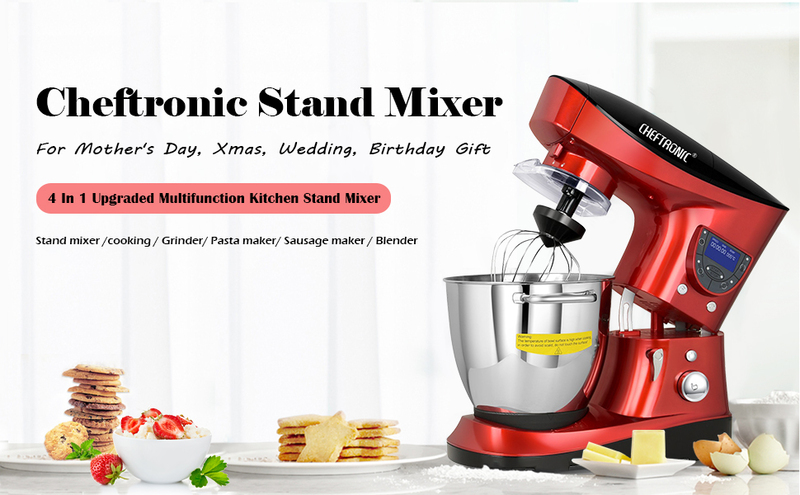 These CHEFTRONIC 4 In 1 Upgraded Multifunction Kitchen Stand Mixer SM-1088, 1000W 7.4QT Precise Heat Stainless Mixing Bowl with Meat Grinder Blender for Mother's Day, Xmas, Wedding, Birthday Gift , is sized at 16.5 x 13 x 13 inches . This has an 7.4QT handle Stainless Steel bowl. This is a large enough capacity to mix dough for 13 dozen cookies, 8 loaves of bread or 8 pounds of mashed potatoes in a single batch. Wow. It comes with everything you can think of and more. 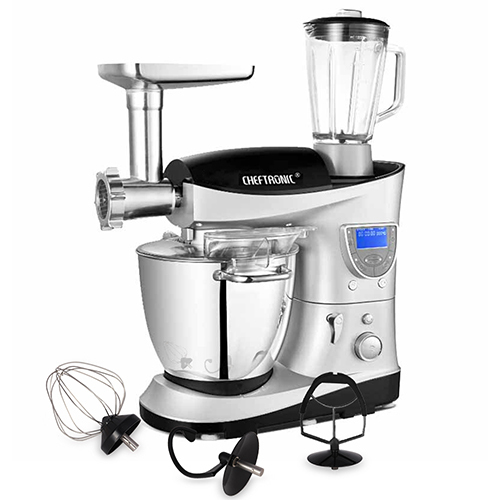 It comes with an dough hook, flat beater, wire whip, pouring shield, food mincer, sausage maker, jug blender. Plus. You will get an transparent splash guard. This is the perfect size. It can easily be placed on most kitchen counters. The bottom has non-slip grips on it. So it will not move once it is placed. It works great. I love that this comes with all the different pieces. It is so easy to use. The buttons are easily accessible. Easy to push. This is great for any kitchen to have. For baking. Cooking. Blending. Meats. And so much more. The color of the Red is pretty. Bright and colorful.